Note: In a sneaky way, this is a book review of W.P. 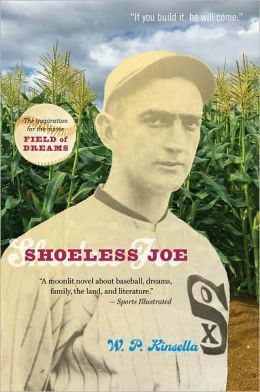 Kinsella’s Shoeless Joe Comes to Iowa, which is the basis for the movie Field of Dreams. This weekend we went on a family hike to Tohickon State Park in Pennsylvania. It is the second time we’ve gone. The first time we went was 3 years ago. Alex was 4 and Jack was 6. The hike is a gorgeous trek across tall grass meadows, through forested hills, over rocky creeks with small waterfalls, and finally up to a rocky ridgeline that has a gorgeous view of a wide valley. You can see the river way down below and look out over miles of green trees. In all it’s about 2 miles to get to the ridge – just about the limit of a 4-year-old’s endurance. But when we did it 3 years ago, Alex was amazing. Both boys were. We have a great time making our way up and over the trail. Shani spotted a garter snake that me and the boys surrounded and tried to catch. Pretty good is an understatement. The cut went across his kneecap and I could see the bone. It was bleeding a lot. I pulled my shirt off, tied it really tight over his knee, put him up on my shoulders, and we double-timed it back to the car. Now…this is going to sound crazy, but the hike back was actually fun. Alex actualy enjoyed the ride. Jack understood the gravity of the situation and hiked back without any complaint. And we made good time. A shirtless dad strides into the ER, carrying a young, bleeding child. I felt manly and heroic. The nurses came running up to me and carefully took Alex as they asked me what happened. They complimented my effort, carrying the wounded boy for 2 miles. What a good dad I was. You enter the ER. There sitting in the waiting room is a flabby man without a shirt on. I felt like a complete loser. And this was not a moment – it was 45 minutes. Old ladies, families, nurses, hospital employees – each one that came into the waiting room would look at me and shake their head. None of them sat anywhere near me. I did my best to puff out my chest and cover my love handles. My back kept sticking against my chair. A lousy ending to the hike. Fast forward to this weekend. The hike was just terrific. We shared trail mix and passed the water. The boys scaled fallen trees and chased toads through the leaves. Shani and I were laughing about something, I can’t remember what. We made the ridge in about 90 minutes of easy hiking. As we were coming back, Shani and I were talking about where we would get ice cream after the hike. The boys were ahead of us. I had gone for a long mountain bike ride that morning. It was in the 80s with a steady, soft breeze. I watched my boys hiking next to each other on a path meant for one person. They have no sense of personal space between them. It’s shared space and their shoulders and hands touch all the time as they walk without them even thinking about it. It made me think of the end of Shoeless Joe Comes to Iowa. The story is about a farmer in Iowa who builds a baseball park in the middle of his field because a voice tells him to do it. The ghost of Shoeless Joe Jackson and a bunch of other ghosts come play there every night. “No, it’s Iowa,” the guy responds. A special day. Now…if you’ll excuse me, the boys are in bed and I’m going to give Shani an extremely thorough check for ticks. We went through some tall grass today. You can never be too careful.